First, let's examine Ultron. He has an adamantium shell, hypnotic powers, "a genius intellect, a capacity for creative intelligence and self-repair, superhuman cybernetic analytical capabilities, and the ability to process information and make calculations with superhuman speed and accuracy" (from the Wikipedia entry). Unfortunately, his personality is based on the brain of Henry Pym, the biggest loser in the Marvel Super Hero Pantheon. As evidence, he once created a robot bride with the brain of Mockingbird. Mockingbird! And has been defeated by the West Coast Avengers at least once. How he had the cajones to show his face at the annual Super Robot Villain convention that year, I'll never know. On the opposite side we have Optimus Prime, the noble and powerful leader of the Autobots. In addition to his massive durability, strength, and intelligence, Optimus Prime contains within himself the Matrix artifact, which gives him the awesome acting ability of Keanu Reeves. No, wait, wrong Matrix -- which gives him the power to do whatever the writers need him to do at any particular point. Plus he has a laser gun that goes pew pew. However, his "super power" is to turn into a Mac truck. With flames pointed on the side. That's right, he's a big, smelly, gas-guzzling long-hauler who usually has a fat bald guy with back hair (hey now, that could be me I'm talking about!) sitting in his lap. Not exactly intimidating. So who would win in a fight between these two titanic titanous titans of titanosity? Would Ultron's concussive blasts and impenetrable skin be a match for Optimus Prime's centuries of experience in warfare and alien technology? Would the universe collapse into a singularity in an all-out acting war between Keanu Reeves and Shia LaBeouf? Only you can resolve the conundrum, my friend! So chime in and let us know who you think would win, and why! 26 Responses to Poll Position: Robots ATTACK! My guess, Optimus Prime will commit suicide to try and kill Ultron. I actually like Prime better… But Ultron owns this one. Can we assume ultron still has the android Vision under his control? 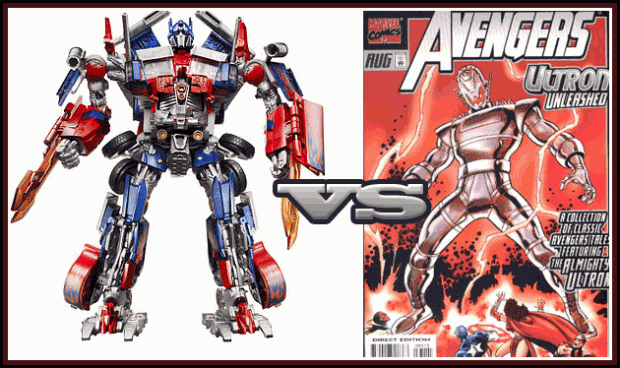 If so ultron no doubt otherwise still ultron, cuz optimus has nothin to crack adamantium. Ditto on the Optimus suicide scenario. First he’d give the matrix of leadership to some loser. Then he’d make a big speech as to why all life is precious, even one as evil as this. Then he’d spend a while explaining why killing himself is the “only” option. Then he’d fly Ultron right into the sun…or something. Optimus prime: always ready to die for others…never ready to hear a possible plan B!! Honestly I love Optimus. And I truly believe he would find a way to win. But normally when optimus overcomes insurmountable odds its usually with the help of his autobot friends. I think a one on one fight would be close…still think prime would win…but not without getting the crap beat out of him. Neither.. Some ones gunna nuke ’em and the EMP will kill ’em both for ruining large cities with their evil giant robot ways. Some one call the pow’a’ wrangers. I’m going with Ultron on this one. I think the reason that Ultron has been defeated by the Avengers in the past probably has something to do with an inherent inferiority complex from his Hank Pym personality. But in at least one reality, Ultron has managed to conquer the world and laid waste to all organic life, so, there’s always the potential there. Regardless, the point is that Ultron is made out of Adamantium. Optimus Prime is made out of a million moving parts that Ultron won’t hesitate to rip out or blast to destroy him. I won’t lie to you though, I may have been seriously influenced by having recently watched the Avengers XD episode where a small army of Ultron clones (without an Adamantium shell) basically lay waste to Kang the Conqueror’s forces. I dunno, I know Ultron is tough but he’s not very bright (I mean, what kind of evil robot spends most of his time going after a girl). Optimus is very smart (centuries of battle under his belt) and very good at fighting. Yeah maybe he talks a lot but he always gets the job done. I think Optimus would find a way to beat Ultron. Most likely he’d commit suicide then use the Matrix to bring himself back or something. It could work. this community has too much faith in the good guys, they do lose sometimes, just making it a possibility. Prime has height advantage, and speed advantage! i’m sorry, but the bay movies have ruined my opinion of optimus prime. Ultron would destroy prime. Sorry, I’m not buying it. Optimus Prime has more (and by more, I mean thousands of years) experience killing evil robots than anyone else out there. Ultron, despite an adamantium shell, gets blown up every two years or so, and gets beat in other ways even more often. Heck, he can’t even kill Hank Pym. If this is a comic book fight, the hero always wins over all, and the best the villain can hope for is a mutual suicide (as mentioned above). However, realistically speaking, Ultron wins. Granted I don’t know anything about him other then what I just read above, but anyone who has a superbrain that learns how to beat his opponent, AND has regeneration/super-armor is bound to win virtually any fight there is. Ultron has a long history of not living up to his full potential. So I’m guessing he’ll keep that tradition alive by failing to beat Optimus Prime. My knowledge of both these characters is limited, but didn’t it take a full-strength blow from the Hulk just to dent Ultron’s head during the Secret Wars? I think that gives Ultron a pretty fair advantage. Ultron wins. Not because of the Adamantium or because of Prime commiting suicide. But because Ultron, any model, is very good at controlling other sentiant machines (Vision anyone?) Ultron would take over Prime, gain the Matrix then use Prime as weapon against his real enemy… Hank Pym. And that I would pay cash money to see folks! Also yes Jeff the acting battle between those two “actors” will destroy our reality, it might be time to leave. Ultron and Optimus Prime are locked in mortal combat. Explosions happen, even if there is no logical reason for explosions to happen. Josh Duhamel’s military unit is taking shots at Ultron, but as usual, are proving absolutely useless, that they might as well be armed with stink bombs and flyswatters. Ultron is smashing his Adamantium fists through Optimus Prime’s armor. Optimus Prime grabs Ultron and throws him. Ultron, upon getting up, examines the surroundings, and finds the chink in Optimus Prime’s armor: he grabs Shia LaBeouf as a hostage. “No, Sam! Run!” Optimus Prime knocks Ultron aside again, and triggers the Prime Matrix. Things dissolve into slow motion and extreme close-ups. Sound effects are muted, while melodramatic music plays. The Prime Matrix fires off Ultron’s Matter Re-Arranger, causing him to seize up. Optimus Prime collapses. Shia LaBeouf yells out Optimus Prime’s name. Megan Fox/Rosie Huntington-Whiteley starts crying. There are many more explosions. The light in Optimus Prime’s eyes fades. It is a Pyrrhic victory. Or was it? A few days later, we learn that Ultron has transferred his consciousness into the next Ultron in line. And he comes back to kidnap Megan Fox/Rosie Huntington-Whiteley with designs to make her his new bride (because, you know, that’s how Ultron roles). For the next hour, we follow Shia LaBeouf around a hackneyed narrative to resurrect Optimus Prime built around socially embarrassing robots and more explosions. A scene with John Turturro as a crazy paranoid is probably involved. And dear God, I don’t care anymore! I’ve probably checked out around the time that the Prime Matrix ended the initial fight. I agree with you Myro, I used to love the transformers I had so many my room was actually their room that I borrowed. But After the end of the first film I felt betrayed.. So much so I E-bayed my whole collection. Micheal Bay is the real destroyer of the transformers forget Unicron.. So thats that a transformer fan who kills off one a childhood hero with a robot made by Hank Pym to spare the pain of watching any more… It a sad thing..
Optimus Prime would cut off Ultron’s arms, shoot him in the face, then cut off what’s left of his head and give it back to Ant Man. Because THAT’S how Optimus f**king Prime rolls! Myro, I honestly don’t know whether to commend you for your spot-on deconstruction of the Michal Bay “Transformers” formula…or pity how Michael Bay, over the span of three movies, took your vibrant childhood memories and drained them lifeless. Oh, and I’m contractually obligated to state that a single Doombot would vanquish both Optimus Prime and Ultron. Joshua (23): I’m open to some of both, actually. Except that Michael Bay managed to drain all joy from the Transformers franchise in only two movies (I have not watched the most recent one). Also, all hail Doom! I was thinking, if Doom had made Ultron, instead of Pym, it would have enslaved the planet for him long ago (unlike Pym, who clearly doesn’t think things through most of the time, Doom has thought ahead, and programmed all Doombots with a subservience subroutine so they would never act against the true Doctor Doom). Also , I’m pretty sure Doom-Ultron would have made sure Galactus’ most recent visit to Earth would have been his last, decapitated the World-Devourer, and mounted the head on the moon as a warning to the Skrulls, Kree, and Shi’ar to keep moving on, lest Doom decides to conquer their respective empires as well. Ultron has Optimus beat in capabilities (Ultron’s weaponry could conceivably damage Optimus, but Optimus has nothing that could conceivably scratch Ultron’s polish), but Optimus has one honkin’ advantage – the hero always wins, even if it takes a ludicrous Deus Ex Machina to arrange. Sure Ultron comes back (it’s Marvel, partically everyone comes back, same thing for DC), but Ultron can’t kill Prime and keep him dead.